We're not sure whether anyone looking for a dual-SIM phone cares about the music-playing skills. Alternatively, the presumably younger crowd drawn by the impressive audio package is probably not too interested in dual-SIM telephony. Whatever the case, the Nokia X2-02 doesn't pose a dilemma for users. In fact, the price tag implies no hard choices. A cheap phone, that handles two SIM cards and is a great music player, is more likely to be popular with different groups of people rather than fail to find its target. S40 phones do well - they don't usually offer big surprises, but that keeps the disappointments to a minimum too. They don't charge a fortune either. The X2-02 is a great example. It's cheap because it offers a very basic set of features. But it's cheap too because it didn't cost much to design and build. The Nokia X2-02 is based on two older entry level phones and, amazingly, it doesn't cost more than either of them at launch. The X1-01 is the dual-SIM prototype, while the X2 has the Xpress Music pedigree. Now, we're not sure whether anyone coming from either of those will consider the X2-02 as an upgrade. Nokia must be taking account of the fact though that the demand for even the most basic of phones is slowly getting more sophisticated. 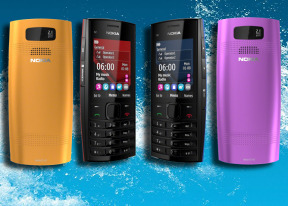 Nokia have been busy expanding their entry-level lineup and dual-SIM phones are a major niche for them. They've been so prolific lately that you may find it hard to believe that Samsung have about twice as many dual-SIM phones to offer - and that's not counting the touchphones and smartphones that come with dual-SIM telephony. The Samsung C3322 is an almost exact match for the Nokia X2-02. Sure it doesn't have the built-in antenna and an FM transmitter but it's a truly worldwide phone with quad-band support for both SIM cards. The Samsung E1232B is another fairly recent phone, which however has a lot less to offer. It's a basic package, the flashlight kind, in the same vein as the Nokia X1-01. There's plenty of choice in Nokia's own backyard too. The Asha 200 is one that we quite liked. That's where it gets really hard to choose though: a dual-SIM QWERTY messenger or a dual-SIM music player. We guess both will enjoy robust demand. Anyway, they both show that Nokia's dual SIMs are well beyond the most basic calling and texting, with multiple phonebooks to accommodate phone sharing within the family. The X2-02 is not that kind of phone. Unless it's your music you want to share.